In Portland, Oregon, the prison used by Immigration and Customs Enforcement is housed in a nondescript building tucked between a highway and the waterfront south of downtown. The tan three-story structure has darkened windows and no identifying marks. It’s surrounded by an 8-feet high metal fence, guarded by a security checkpoint, and cameras outside cover every angle. 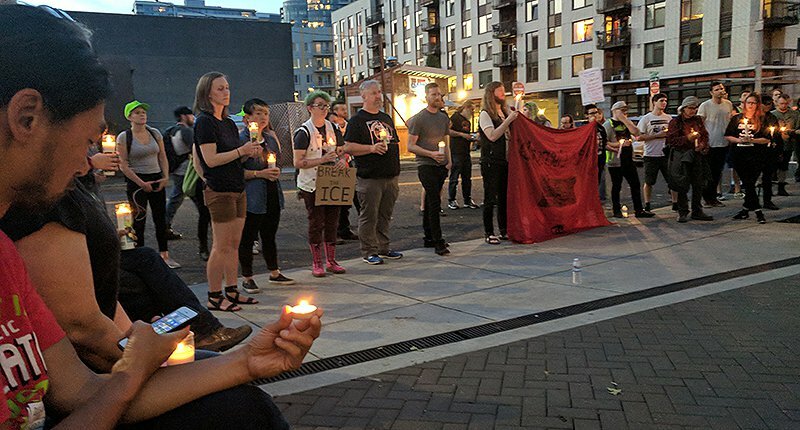 Since Sunday night, dozens of protesters under the banner of #OccupyICEPDX have been maintaining a round-the-clock vigil outside the prison. They are demanding an abolition of ICE and an end to the Trump administration’s policy of forcibly separating children from parents fleeing across the U.S. border from violence-ravaged countries. On Monday ICE personnel showed up as usual to implement Trump’s deportation policies. By the end of the workday, the number of protesters swelled to about 70 and they sprang into action. Three cars with darkened windows exited a garage and attempted to drive out the entrance. Some twenty protesters formed a line and locked arms. Staring down the drivers, “They blocked them from leaving the facility,” said Jacob Bureros, an organizer with the Direct Action Alliance. The protesters exploded with outrage “at the ridiculous irony in that statement,” says Nickolaus. Bureros says, “People started yelling, ‘Oh, you need to go home to your families? What about the families you are holding.’” The ICE prison in Portland is designed for temporary detention. Immigrants are usually shipped off within days on buses operated by the GEO group, a private prison-industry contractor, to a long-term ICE prison in Tacoma, Washington. Sporadic negotiations ensued with DHS police. Protesters told police ICE employees were welcome to “leave on foot,” but they would block vehicles. Police responded, “If you blockade, there will be arrests,” said Nickolaus. Close to midnight, another attempt by an ICE employee to drive out was stopped by more than a dozen protesters without arrests, says Bureros. A back entrance and a side entrance were left unguarded by protesters, however. Tuesday afternoon three civilian vehicles escorted by DHS police left the rear of the facility. One person blocking their way was arrested, witnesses said. Tuesday evening, Portland police, who had been absent, showed up in force. Corbin, a local activist, says about 10 Portland cops, along with DHS police, formed a gauntlet at a side entrance and shepherded the last five ICE employees out of the building as protesters crowded around shouting, “You should be ashamed.” The ICE personnel were bundled into cars and whisked away. Outside, protesters vow to build on their anti-ICE movement. 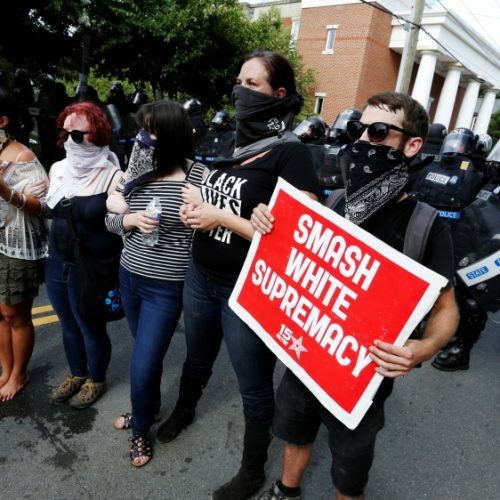 With the beginning of summer, a wide range of activists, including many youth wearing anti-fascist paraphernalia, are flocking to the cause of continuing the occupation to prevent the ICE facility from operating. Deliveries of pizza from supporters and groceries have been pouring in along with volunteers. Nickolaus estimates about two-hundred people have surrounded the building, and at least a dozen tents have been set up, along with a commissary and medical tent. A local ice-cream truck came by to dispense free sweets to protesters and used its vehicle to block the driveway into the ICE facility. 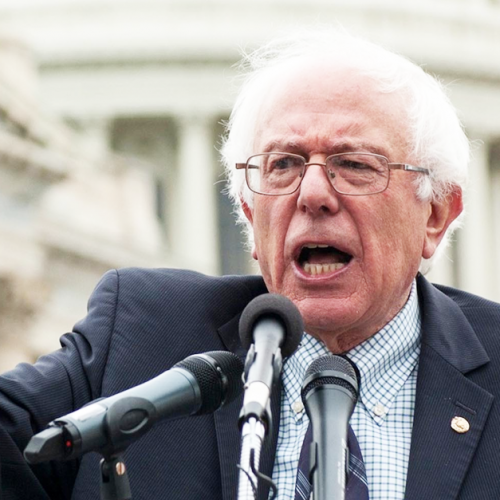 Did Bernie Sanders Call for an END to the Police State in This Interview?